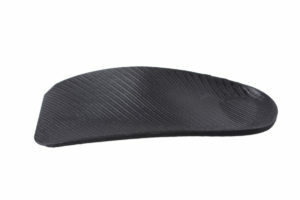 Slimline and cheaper orthotics options. As a podiatrist during the 1990’s, the making of orthotics was a time consuming and, therefore, expensive practice. It took around six hours in my home ‘orthotic lab’ to knock out a pair of orthotics. Since the advent of commercial laboratories through the 1990’s and beyond, there have been many recent advances in the design and manufacturing of orthotics. Materials have also improved markedly, allowing us to deliver more flexibility and bounce in the devices. Walk Without Pain Podiatry Clinics has taken advantage of these opportunities to reduce costs and create cheaper orthotics while still providing a custom made device individual to your needs. This new method still allows for all prescription variables to be available to the podiatrist, and so we can produce a completely custom-made device for around 60% of the cost of the traditional methods of manufacture. Health Insurance cover for orthotics. Some health funds may cover the whole cost of these orthotics with no gap. This will depend on your level of cover and insurer. We have HICAPS claiming available in the clinic so you can avoid being out of pocket for these fees. Who might want cheaper orthotics Brisbane? Children whose feet are still growing. It can be expensive to throw away traditional orthotics each year as your child grows. Often health insurance covers all or most of the cost of these cheaper devices. People without private health insurance, who are responsible for the whole cost of orthotics out of pocket. People who want to reduce out-of-pocket expenses or have no gap (depending on health fund and level of cover). Any downside to this method providing cheaper orthotics Brisbane? For some people, yes. Not every person’s condition can be treated with this method. We would need to see you in the clinic to give you specific advice. Complex conditions such as bunions and lower back pain are more likely to require a traditional orthotic. Simpler to treat conditions such as heel pain and forefoot pain generally respond very well treatment with this option. How long do these orthotics last? Around 4 to 5 years in average people. A little less in heavier or more active patients. Anything else to know about these cheaper orthotics? Yes! The method of manufacture is by routing from a solid block of material. In our opinion, this is superior to ‘sheet’ methods because the orthotic can be any thickness and shape that we prescribe, not limited to the two sheet thicknesses available. The average thickness of our devices is 3.5 mm. Want to have extra bounce for running? We can cut in a flexible section. Did you flatten your last pair? We can reinforce key areas. Where can I get these cheaper orthotics? Each of our four Brisbane podiatry clinics can help. We are at Hamilton, Indooroopilly, Bribie Island and Toombul (6 days per week). All of our podiatrists are fully trained in orthotic design using this approach. As far as we are aware, no other Brisbane podiatry clinics are using this technology.